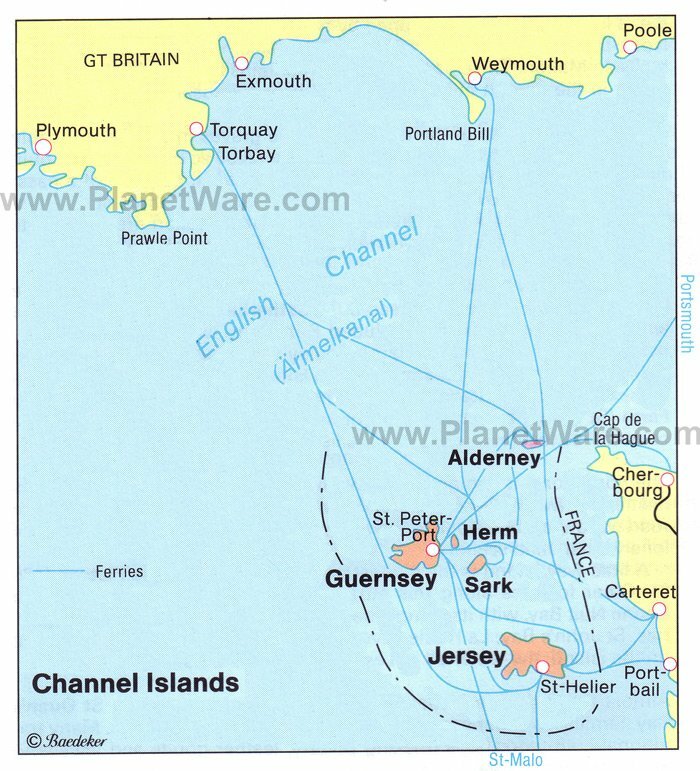 About 14 miles off the coast of France, the Channel Islands consist of (in order of size) Jersey, Guernsey, Alderney, Sark, and Herm plus many smaller islands, each with its own unique character. The islands are well served by air from London and many other English cities, and in summer, daily ferry crossings are available from Portsmouth and Poole in England, and Cherbourg and St. Malo in France. A good itinerary for visitors includes spending two days sightseeing on Guernsey, a day exploring Sark, followed by a day in Alderney, finishing up with a three day stay on Jersey. A good time to visit is during the five-week long Channel Islands Heritage Festival running from April through May, featuring special openings of historical sites, exclusive tours, and themed guided walks involving all five islands. Jersey, the biggest of the Channel Islands, extends nine miles from east to west and five miles from north to south. This spectacularly beautiful island offers plenty of striking scenery, especially on the north coast with its high cliffs, rocky inlets, and caves. For hikers, the flatter area to the southwest offers great trails, including a pleasant footpath running along the disused stretch of the old Jersey Railway from the village of St. Aubin to Corbière Point. St. Helier on St. Aubin's Bay is a lively town that has retained much of its Victorian charm. Tourist attractions include Liberation Square, La Collette Gardens, Charing Cross, and the Waterfront Centre, as well as Elizabeth Castle in the harbor area. Built during the reign of Elizabeth I and located on a small rocky island reached by ferry or causeway, this is where Charles II took refuge, as did 6th-century apostle St. Helier. Other attraction highlights include Royal Square, with its 10th-century Town Church, Royal Court House, States' Chamber, and a gilded statue of George II. To learn more about the island's rich history, visit the Jersey Museum and Art Gallery, with its interesting archaeological and historical art collections. Gorey, about 10 miles from St. Helier along the beautiful coastal road (five miles if you travel inland through Grouville) is a charming little town with a row of picturesque houses along the harbor. The pier below the castle is the location for the annual Fête de la Mer, the island's excellent seafood festival. Gorey is dominated by the formidable Mont Orgueil Castle, a magnificent example of medieval military engineering dating from the reign of King John. La Hougue Bie, one of the world's oldest buildings, is a large burial mound topped by the 12th-century Norman chapel of Notre Dame de Clarté and the Jerusalem Chapel (1520). The crypt of the latter contains a replica of the tomb of Christ found in the Church of the Holy Sepulchre in Jerusalem. Excavation of the mound in 1924 revealed one of the largest passage graves in Europe, dating from 2000 BC and built from stones weighing up to 30 tons. St. Catherine's Bay is a favorite spot with anglers, as is secluded Rozel Bay with its narrow, sandy beach. For a truly unique experience, spend a night at Archirondel Tower. Built in 1792 on a rocky outcrop overlooking St. Catherine's Bay and used as a military garrison, this striking red and white tower sleeps up to 10 (bring your own sleeping bags; washrooms are at the café nearby). The superb Durrell Wildlife Park was established in 1958 by writer Gerald Durrell, famous for his many books chronicling his adventures as one of the world's most prominent naturalists. With a focus on conservation, the zoo includes numerous rare mammals, birds, amphibians, and reptiles and offers a variety of fun educational programs, including talks with its zookeepers. Afterwards, explore the romantic north coast around Bouley Bay, with its small sandy bays nestling between the rocks. At 446 feet, Les Platons is the highest point on Jersey and offers great views of the north coast, including Bonne Nuit Bay, with its shingle beach and the Mont Mado granite quarries. While there, explore St. John's Bay; La Houle Cave; and Sorel Point, the most northerly point on the island. Almost the entire west coast of Jersey consists of a single, wide bay - St. Ouen's Bay. The area is popular with surfers due to its waves and with other visitors for its nature, wildlife, and spectacular views. Those interested in the history of WWII should visit the Channel Island Occupation Museum. Although only half the size of Jersey, Guernsey contains almost as many great reasons to visit as its larger neighbor. The spectacular cliffs on the south coast rise more than 270 feet and are a big tourist draw, as are the island's numerous restaurants, with their reputation for delectable European cuisine (hence the island's nickname, "Gourmet Island"). The narrow streets and alleyways of St. Peter Port climb steeply from the harbor to the highest point in the town with its commanding views. Many of the houses are Regency in style, giving the town a pleasant old-world air. The town is noted for its shopping district, historic sites, and leisure facilities, as well as active things to do, such as cycling, surfing, diving, fishing, bird-watching and sailing. Important landmarks include the 12th-century Town Church and Hauteville House, which from 1859 to 1870 was the home of French writer Victor Hugo, a political refugee at the time. On a small island connected by Castle Pier stands Castle Cornet, founded in 1150 but largely Elizabethan in its present form. The castle houses several museums of interest to history buffs: the Story of Castle Cornet, the Royal Guernsey Militia Museum, the Maritime Museum, the 201 Squadron RAF Museum, and the Royal Guernsey Light Infantry Museum. Guided tours are available of the castle along with its four period gardens. Other highlights include the daily noon gun salute by costumed staff, as well as the many pleasant trails that crisscross the castle grounds. On the east coast of Guernsey are a number of historic Martello Towers, as well as the ruins of Vale Castle, an early Norman Vale Church, and a large passage grave. The south coast is equally interesting and attractive with many splendid cliffs and caves, the largest being the 200-foot-long Creux Mahie. Corbière Point is of interest for the green veins in the pink and gray granite, as is Rocquaine Bay on the west coast. Finally, the tiny island of Lihou, linked to the mainland by a causeway, has the remains of a 12th-century priory. Only four miles long and one mile wide, Alderney enjoys a mild climate, abundant wildlife, a rich history, and stunning secluded beaches. Almost treeless, it rewards the adventurous with beautiful sandy bays, indented cliffs, and rugged tors to explore. Tiny St. Anne dates from the 15th century and has a distinctly French air, with cobbled streets, snug inns, cafés, and shops. St. Anne has a mild climate, lots of sunshine, and a picturesque harbor, and its visitors enjoy walking the cliffs, golfing, fishing, and windsurfing. In Telegraph Bay are two interestingly colored rocks known as the Two Sisters, and the uninhabited Burhou Island is a bird reserve best visited by boat (except during nesting). Alderney can be reached by direct flights from Southampton and Guernsey, as well as via a seasonal ferry service from France and the other islands. Often referred to as the "jewel of the Channel Islands," Sark is the smallest of the main islands (population around 600) and part of the Bailiwick of Guernsey, with its own parliament. Boats visit daily in summer from Guernsey and (less frequently) from Jersey, returning the same evening, landing at La Maseline on the east side of the island. La Collinette is Sark's main settlement and has a church, an old manor house, a windmill (on the highest point), guesthouses, and inns. Car-free Sark - only tractors and horse-drawn vehicles are permitted on the roads - is a delight to explore on foot. The most rewarding walk is to Little Sark over the rocky isthmus called La Coupée. After the last war, a new track was constructed across this narrow and rugged neck of land, which falls steeply more than 250 feet to the sea. The Little Sark path leads to Port Gorey and two very famous rock pools: the Bath of Venus and the Pool of Adonis, both with good bathing at low tide. Beneath the bizarrely shaped cliffs overlooking Brecqhou are the interesting Gouliot Caves, filled with sea anemones and other coastal life forms, but only accessible at low water. A path leads to the former fishing harbor of Havre Gosselin. Dixcart Bay on the southeast side of the island is another picturesque spot and is where most of the island's holiday accommodation is found. It's also where you'll find Le Creux Derrible, a cave with a natural 180-foot cleft in its roof, accessible only at low tide through two rock arches. The small island of Herm lies three miles due east of St. Peter Port. Although the resident population is only 68, Herm attracts up to 1,500 visitors a day during the summer. The island has a hotel, a number of old stone houses converted into holiday homes, and a campsite. Many species of rare flowers and plants thrive in the moderate climate, and lovely Shell Beach is famous for its more than 200 different types of seashells.